I’ve had the fantasy of running away for a long time. In reality, my life is damn near perfect, but I love the idea of going away to write: no emails, no housework, no dishes, no litter boxes, no play dates, no driving. No responsibilities, except to the muse. My friend Martha had gone to a retreat center in southwestern Michigan. Every time she told me about it, her voice grew misty. She’d finished a book there. She’d written chapters. I wanted to drink from that well. Both of us have big birthdays coming up. Originally, I’d thought about surprising her: just showing up on her doorstep and telling her to pack, not telling her where we were going. 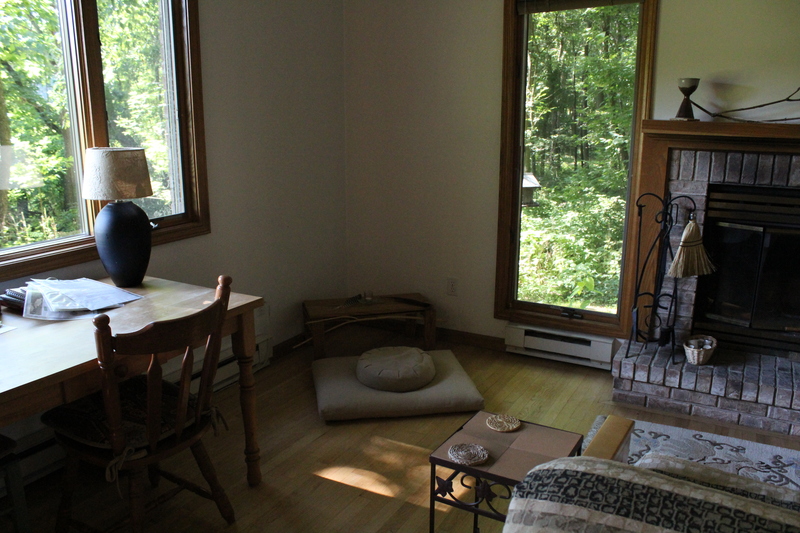 I realized that one of the best parts of retreating to write, even if it’s only for an afternoon, is the anticipation. Your brain performs some kind of chemical magic as it prepares to conjure the words. I didn’t want to cheat her of that. I decided I’d take the novel I’ve been trying to overhaul for longer than I want to admit. It’s my first novel, but I have not been able to find a home for it. It’s not a YA, although the protagonist is young. It’s not a romance, even though it’s about a straight couple getting to know each other. I wrote it so long ago that I’ve changed, even though the heroine hasn’t grown up. I love this book. I needed to go to the middle of nowhere to clear away all the distractions in my life and figure it out. I couldn’t imagine going with better company. This entry was posted in Travel adventure, Writing Retreat and tagged Death of Memory, GilChrist Retreat Center, inspiration, Martha Allard, wildlife. Bookmark the permalink. Good luck on the novel! I have one that I need to finish – you have inspired me.